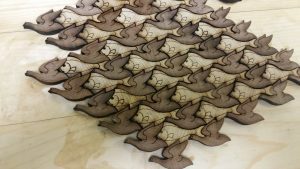 Splatspace member HL Herring is working on a tesselated cheese board, using our laser cutter. Fans of M.C. Escher will recognize the design. It’s coming along well, and we hope to have images of the finished board soon. Nice work, HL!